Do you kids love hockey? Are they on the edge of their seats, cheering loudly, and begging to stay up until the end of the game? 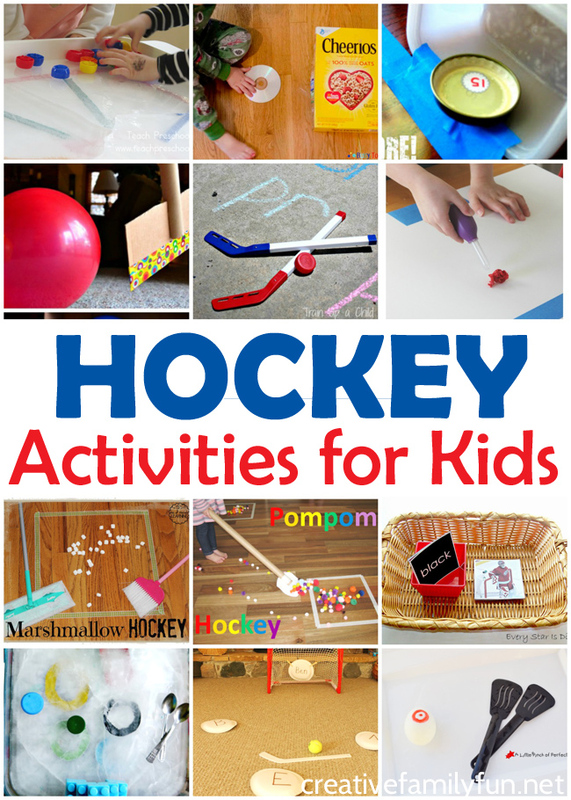 If so, they’ll love this fun collection of hockey activities with everything from crafts, games, and learning activities. These ideas make great boredom busters. Save these ideas for those days when you’re stuck inside because of bad weather. Grab a few supplies, gather the fan club, and get ready to have some fun! Play Tabletop Hockey. Find out how to make this simple tabletop game at Little Bins for Little Hands. Play Marshmallow Hockey. Your kids will love this fun boredom buster from Lovely Commotion. You’ll love how easy it is to set it up. CD Air Hockey. Finally, something fun to do with all your old cd’s! Set up this fun game from Busy Toddler to keep you little toddler busy. Create a Mini Hockey Rink. You can use this tiny ice rink from Playtivities for all sorts of fun games. Play Balloon Hockey. 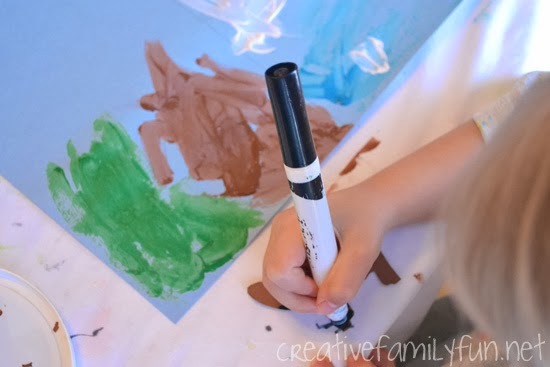 This game from Creative Connections for Kids is a fun thing to play when the kids are stuck inside. Play Pompom Hockey. This game from Learning 4 Kids is a great way to get your kids moving inside. Do Hockey Science. Find out what will slide the best on ice and expore friction with our hockey science project here. Table Hockey With Eggs. Experiment with friction with this fun STEM activity from A Little Pinch of Perfect. Make a Cardboard Hockey Stick. 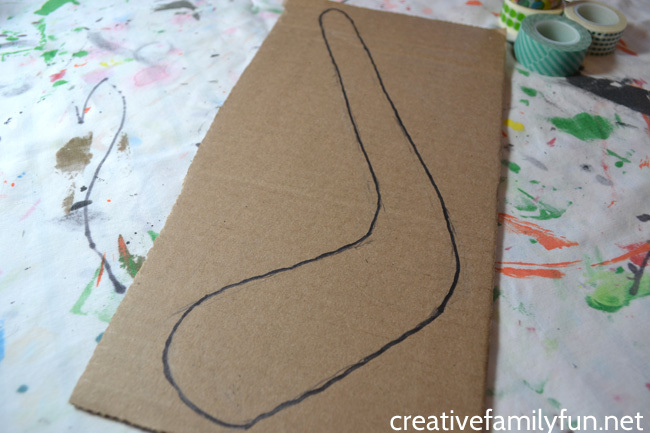 Use recycled cardboard and a few other simple supplies to make our fun Cardboard Hockey Stick craft. Make a Tabletop Hockey Rink. Your kids will have fun making and playing with this fun hockey rink from Handmade Charlotte. 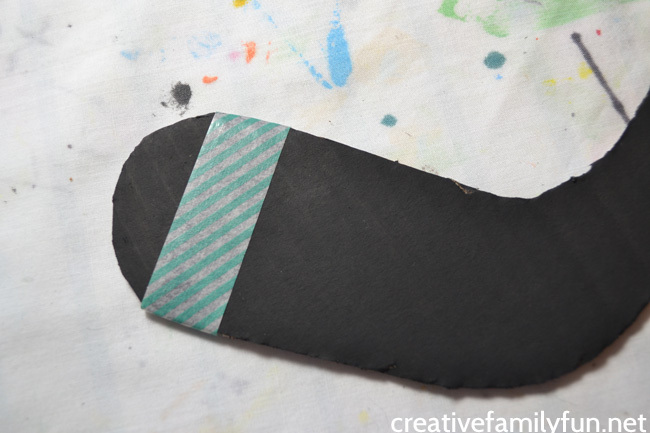 Make Mini Hockey Sticks. 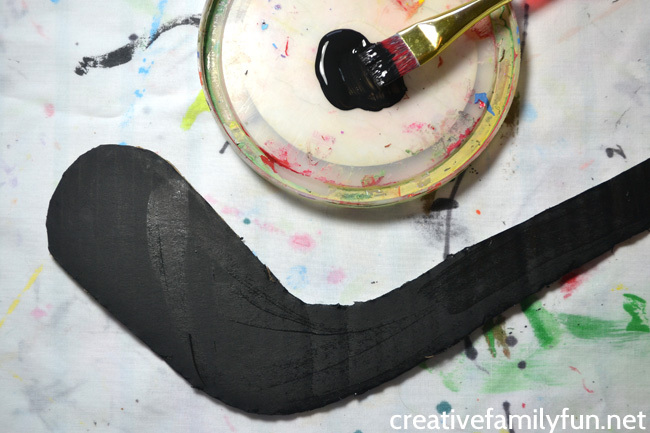 Today’s Parent shows you how to take simple craft sticks and turn them into mini hockey sticks. Gross Motor Phonics Hockey Game. 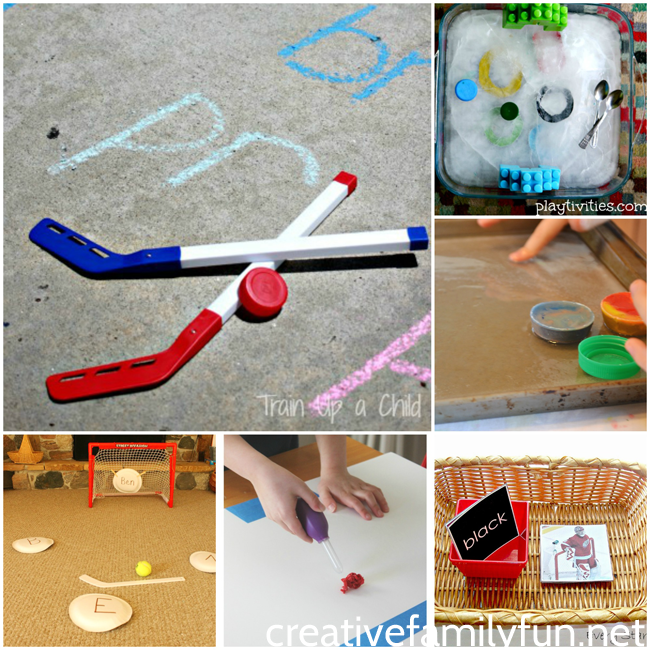 Learn with movement with this fun driveway hockey game from Learn Play Imagine. Print out the Hockey Printable Pack. Every Star is Different has created a fun printable pack for tots and preschoolers. Plus, she shows you so many fun ways to use them. Play Name Hockey. Help you kids learn their name (or work on the alphabet) with this fun indoor hockey game from How Wee Learn. Learn and have fun with Color Ice Hockey. This fun game from Teach Preschool is a great way to help your kids learn their colors. Play Number Hockey. Learn your numbers with this fun set-up from Toddler Approved. SCORE! Are you as in love with all these hockey activities for kids as I am? I’m not sure which ones I love the best. 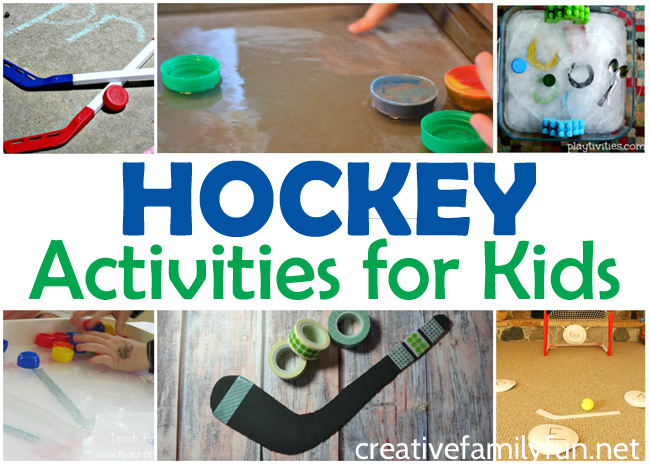 Which of these hockey activities for kids are you going to try? Do you have a kid that loves hockey? Here’s a great craft that they’ll love. 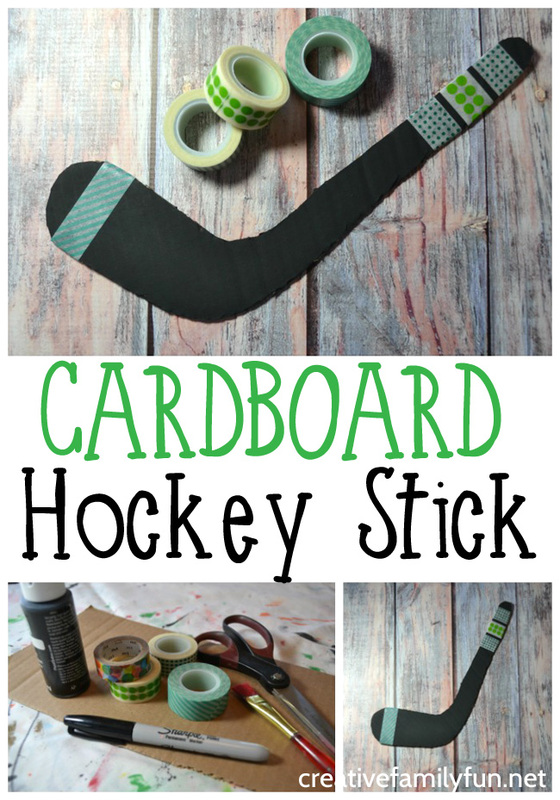 Make this fun Cardboard Hockey Stick to celebrate this fun sport and to make a fun decoration for any hockey fan. Are you ready to make your hockey craft? Let’s grab some supplies and get started! First, you’ll want to draw a simple hockey stick shape on your cardboard. Hint: If you’re unsure of how to get started, just Google “hockey stick” and take a look at the photos. It’s a simple shape, but make sure to use a pencil so you can erase if needed. Once you have your hockey stick outline, cut out the shape. If you’re working with young kids, an adult should do this step. Cardboard boxes can be hard to cut through and need sharper scissors. 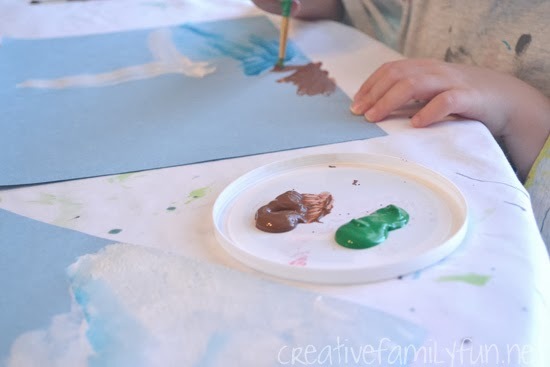 And, if you want to do this craft with a group of kids, I would recommend prepping the cardboard ahead of time and then the kids can paint and decorate their hockey sticks. Once you have your hockey stick cut out, paint the entire surface in the color of your choice. We chose black, but you can do any color. You can even choose your favorite team’s colors! Let your paint dry before moving on to the next step. Once it’s dry, pick out a few fun rolls of washi tape. 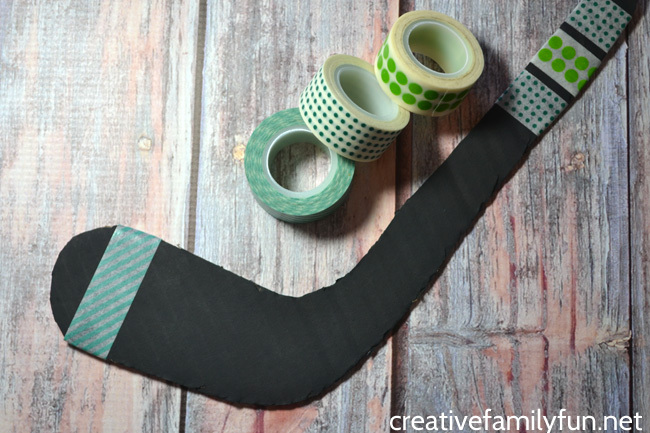 Use the washi tape to make stripes on your hockey stick. Put them around the bottom or the top. Or, put your stripes anywhere you’d like. Don’t have washi tape? 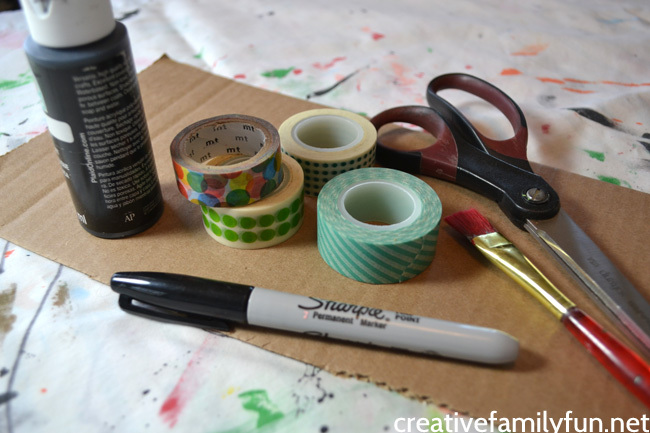 Use can draw designs on masking tape and use it instead. Or, you can just decorate your hockey stick craft with stickers! And, we’re done! Wasn’t this such a fun and simple craft? Your hockey fans will want to make a few of these. Maybe for their favorite team or perhaps one for the team they play on. 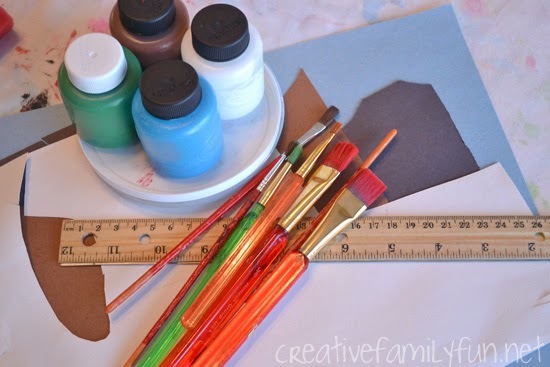 Check out my favorite craft resources. We love to use recycled materials when we make crafts. It just seems much less wasteful to use a few things before they get thrown out. 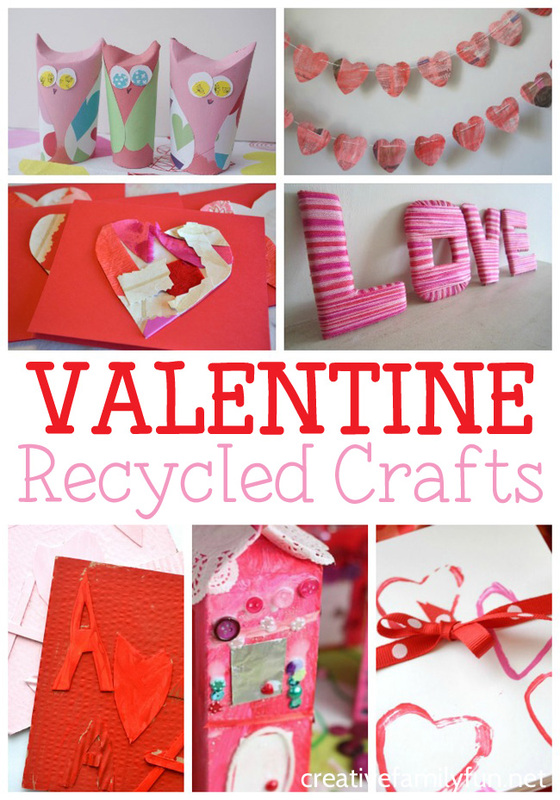 Here are some awesome recycled Valentine crafts that all use an item or two from the recycle bin. They’re all pretty and fun. You’re kids will love them! Let’s gather some supplies and get started crafting. Save your empty cereal boxes to make one (or more) or our Silly Heart Puppets. Before your recycle your empty cardboard tubes, use them to make our Heart-Stamped Valentine Cards. 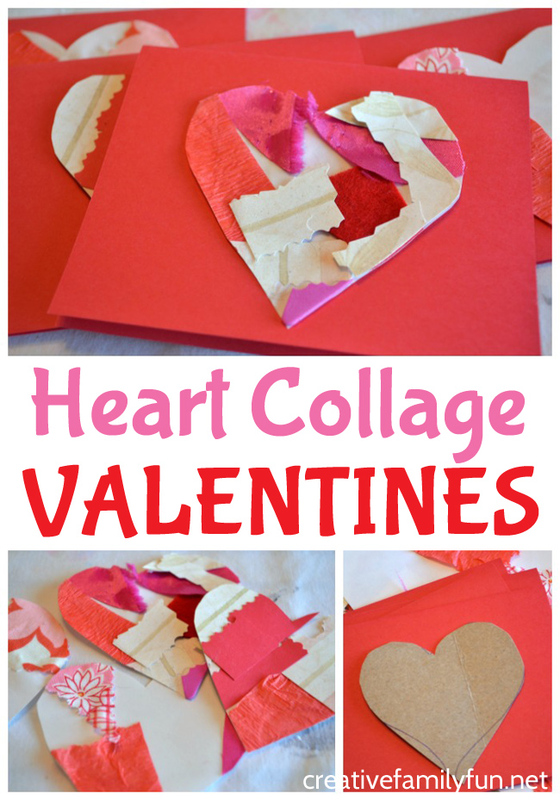 Use up your scrap paper and fabric to make some of our pretty Collage Heart Valentines. 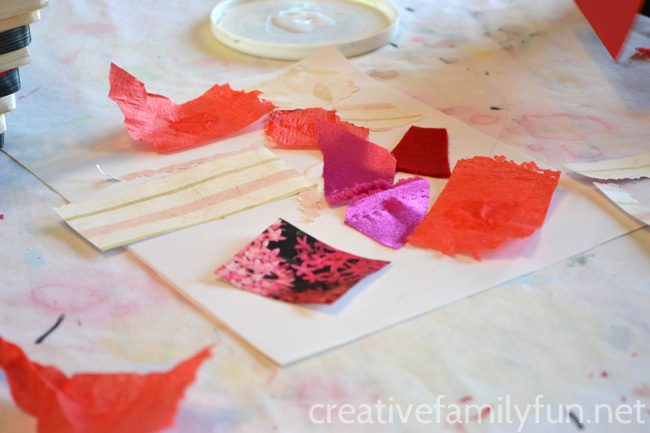 Or, use cardboard and other scraps to make our pretty Monochromatic Collage art project. You can also make pretty Heart Magazine Collages like these from Arts & Crackers. Do you have a pile of old CD’s laying around? I do. 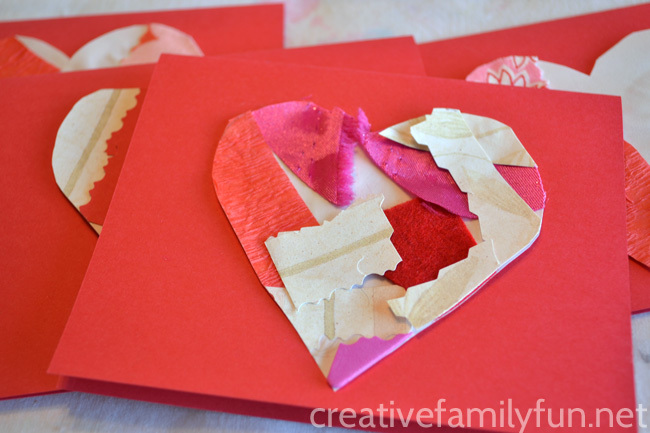 Instead of throwing them out, use them to make these fun Recycled CD Valentines from Crafts on Sea. 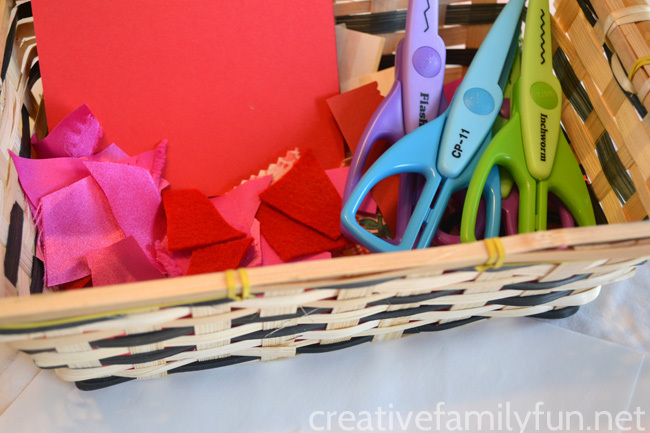 Save an empty tissue box so you can make a cute Valentine Box Robot like this from B-Inspired Mama. Don’t toss that empty milk carton! Instead, rinse it out and use it to make an adorable milk-carton Valentines House from Happy Hooligans. 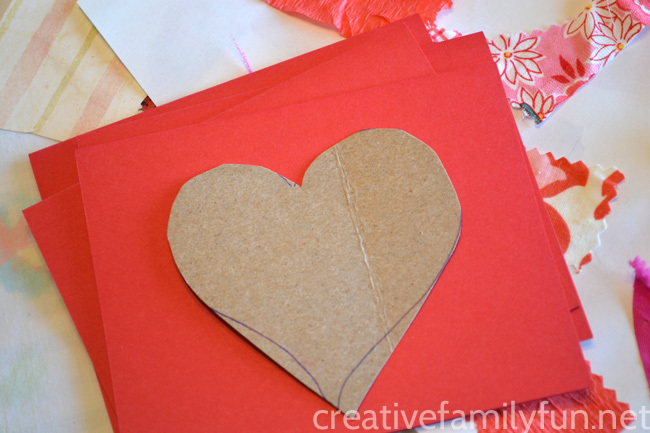 Save your grocery bag to make a cute Brown Paper Grocery Bag Valentine Holder from Buggy & Buddy. Use up your fabric scraps with this pretty Rag Heart Ornament craft from Happy Hooligans. 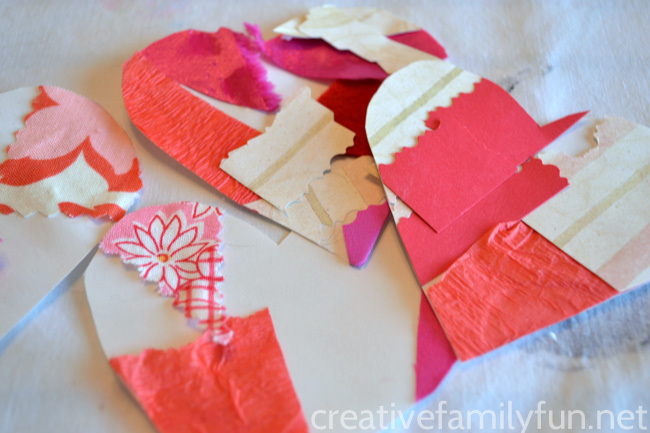 Before you recycle your newspaper, make a pretty Newspaper Heart Garland from Kitchen Counter Chronicles. 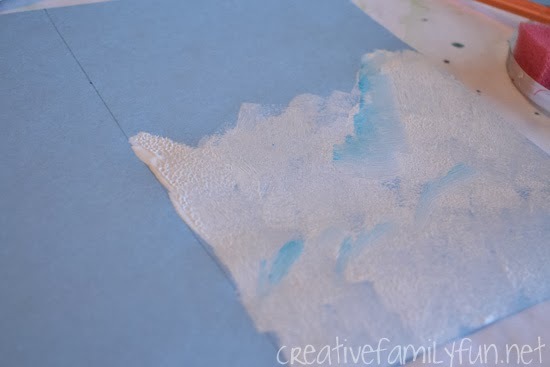 Use the bubble wrap that came in your packages to make a set of Bubble Wrap Printed Valentine Cards from Rainy Day Mum. And, cut up the box to make these simple Yarn-Wrapped LOVE Letters from Rainy Day Mum. Or you can use the cardboard box to make Recycled Cardboard Heart decorations from Arty Crafty Kids. Don’t toss those empty cardboard tubes until you’ve made a couple of these Owl Valentines from Kitchen Counter Chronicles. 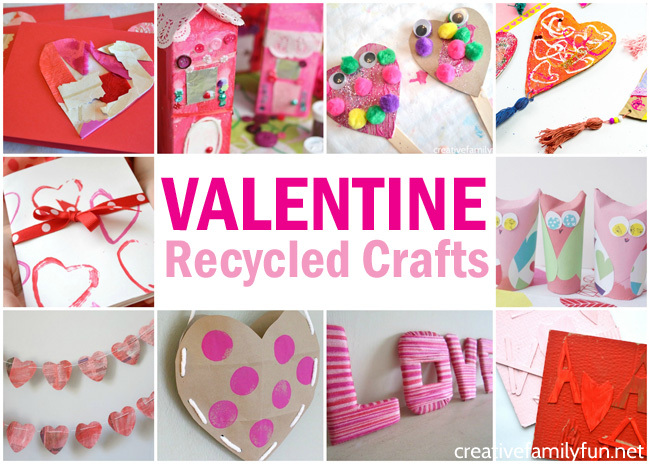 Which of these recycled Valentine crafts are you going to try with your kids? We’ve been learning a lot about Arctic animals lately, and we decided to take a look at the Arctic fox. 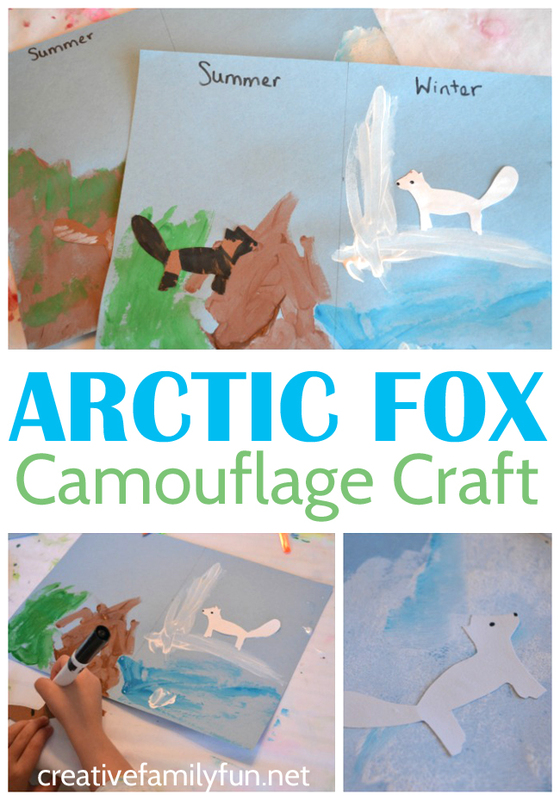 To show off what we learned, we came up with this fun Arctic Fox Camouflage craft. The Arctic fox turned out to be much more fascinating than I first thought. One thing that stood out for all of us was how different the fox looked in winter and summer. This simple observation turned into a fun lesson in camouflage and how animals adapt to their surroundings. We also did an easy art project based on what we learned to provide a visual reminder of how the Arctic fox uses camouflage. Before beginning the project, I used a ruler to draw a line down the middle of our blue paper. One half for the summer and the other half for the winter. 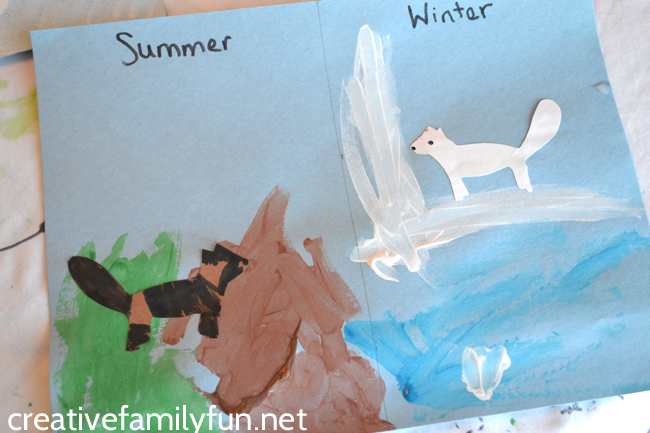 We used our white paint to create a snowy landscape for our winter Arctic fox. Once our painted landscapes were complete, use cut simple fox figures from our construction paper. We made the winter fox from white paper and the summer fox from brown paper. We then used our black marker to draw the details. My preschooler observed that the Arctic fox was both brown and black in the summer, so she added some black stripes and patches with the marker. Once the paint was dry, we glued our foxes onto the correct landscape. We then used our marker to label the different scenes summer and winter. Once we were done we had a great reminder of how the Arctic foxes uses camouflage and adapts to its surroundings with this fun Arctic Fox Camouflage craft. Note: This post was first published on January 23, 2014. Updated and republished on January 5, 2019. You can find out so much about arctic foxes in a good book. Here are some great choices of nonfiction arctic fox books, plus one fun fiction choice!